This time of year is stressful and busy for me and my family. I am sure you feel the same way with work, appointments, shopping and also trying my best to be super mom. Even as I write this blog my 4-year old son is asking me about his ABC’s (he keeps getting stuck after G) it never ends! There are some things I have discovered that are sanity savers for me when I am frazzled that help me feel put together or just plain pampered! This is MY list of things I would LOVE to get as a mom with younger kids as well as some suggestions for those busy women in your life that have been tried and tested by me. And let’s be honest I am not above buying the perfect gift for me, wrapping and placing it under the tree…anonymously. Check out these ideas for unique and easy gift giving this holiday. 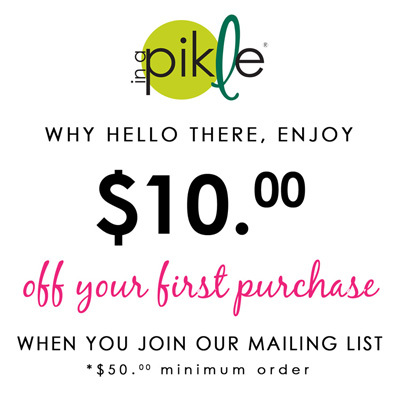 The “In A Pikle” Bundle is also one of my must-haves for my busy days. My favorite style is the Blazing Chevron. This bag is so versatile! I have used it for a diaper clutch, purse, emergency kit for my childs field trips and also a day bag for the fun outings I love to take with my kids. You can pack so much into this bag and I like how there is a place for everything. Currently, I have it packed for a theme park trip I took with my kiddos. I have, baby wipes, granola bars, hand sanitizer, tissues, soap sheets, bandaids, nail clippers, hair bands, safety pins, tool card, toilet seat covers, pain reliever, chap-stick, extra change and hair clips. Plus there is room for so much more! I attach the shoulder strap so I can use it as a cross-body purse. I feel ready for anything! One of my all time favorite things is a gift card – especially an Amazon gift card. They have so many items to choose from, but also Amazon Mom, Prime Pantry and Subscribe And Save options are the best. I use each of these services monthly and a little extra cash for things I use every day make me one happy mom. Comfy pj pants. Nothing beats having a good pair of pants that are not too embarrassing to wear while picking your kids up from school but also comfortable enough to lounge in while doing housework, helping with homework, and taking out the trash to a spot everyone can see. My favorite type of pants are yoga pants since they are stretchy, comfortable, and can hide all the stains you get throughout the day. You know what I am talking about… lunch, juice stains, and that chocolate brownie (that you had for breakfast) smeared on your pants on the way out to door to drop the kids off at school. Reminder Binder. This is one of best things to get for a busy mom. I purchased my first one 2 years ago. This planner is full of colorful pages, calendars, and daily reminder pages. The thing that really makes this organizer stand out for me is the stickers! Nothing makes me happier than small and colorful reminders of the tasks that I need to get accomplished for that day. There are stickers for almost everything you can imagine. Also right around this time of year, she usually runs a BOGO where you can get one for you and also one for a friend. BONUS! Meal planning subscription. Nothing stresses me as a mom than preparing and planning a meal for my family. Between homework and after school activities, it’s easy to get take-out or fast food, which puts a dent in your cash flow (another stressor) and is also not very nutritious. I am all about 5-ingredient recipes that are easy and also tasty for my picky toddler. I currently have a subscription to Six Sisters Meal Plan and for $8 a month I get 6 main dish recipes, 2 side dish recipes, recommended sides, 2 desserts and a shopping list. The meal plans are mailed out every friday. I created a folder in my email box for the emails so when it’s meal planning time I have a plethora of ideas to save time and money. Last but not least another one of my “In A Pikle” items I can’t live without DAILY is my Ruby Red Pikle bag. It contains my Pikle First Aid Kit, Essentials Pak, gum, medication and other items I can’t live without. This bag is small enough to fit in my purse so I am prepared for any emergencies on the go. Which as you know with kids can be anything! I hope these suggestions help inspire you a bit during this holiday season. From one busy mother to another… have a wonderful holiday season! This entry was posted in In A Pikle and tagged bundle, children, Christmas, comfy, daily, easy, emergencies, essentials, first aid, gift ideas, gifts, gving, holiday, kids, meal planning, moms, on the go, outing, pikle, present, purse, quick, small, stress, wrapped.